Baton Rouge, La. – Extension specialists and researchers from the Southern University Agricultural Research and Extension Center will partner with Agriculture is America (AgIsAmerica), a national communications initiative aimed at highlighting the nation’s land-grant institutions, to host a Twitter Town Hall on Thursday, December 3rd from 2 p.m. – 3 p.m. Experts will answer questions regarding the Center’s multi-disciplinary nutrition and health programs as well as the Center’s Fast Track Gardening Program. The SU Ag Center has a history of “linking the citizens of Louisiana with opportunities for success.” For instance, the Center’s Fast Track Gardening program gives incarcerated youth the opportunity to use gardening as a tool to learn more about agriculture and nutrition. A Twitter Town Hall, like a public meeting or seminar, gives the opportunity for a live question and answer period. To follow the conversation or submit a question, include the hashtag, “#agischat,” in your tweet. All agriculture-related organizations, industry leaders, friends, and supporters are invited to join the discussion. For additional information on the SU Ag Center’s Nutrition and Health Programs, visit http://www.suagcenter.com/nutrition-and-health. For information on its Fast Track Gardening Program, visit http://www.suagcenter.com/PageDisplay.asp?p1=12359. Agriculture is America. In short, the agriculture industry – sustained in large by the American land-grant university system through Colleges of Agriculture, Agricultural Experiment Stations, and Cooperative Extension – is integral to jobs, national security, and health. To learn more, visit http://agisamerica.org/. Members of the Southern University Agricultural Research and Extension Center's newly formed Faculty and Staff Senate, from left are, Dr. Kit Chin; Dr. Janana Snowden; Dr. Dawn Mellion-Patin; De'Shoin York; Gabe Gilbeaux and LaKeeshia Lusk. Senate members not pictured are Carol Sensley, Antonio Harris, and Dr. Ben O. Lukongo. Baton Rouge, La. –Southern University Ag Center faculty and staff members met in Room 191 of A.O. Williams Hall on November 16 at noon to discuss the Center’s newly formed Faculty and Staff Senate. The new organization was established to represent every entity of the SU Ag Center in all of its separate categories: Research, Extension, and support units (Communications / Technology and Finance). There are eight members of the board which includes: Dr. Dawn A. Mellion-Patin (President), De’Shoin York (Vice President), Dr. Janana Snowden (Secretary), Dr. Kit L. Chin (Parliamentarian) and senators LaKeeshia Giddens Lusk, Carol Sensley, Antonio Harris, Gabe Gilbeaux and Dr. Ben O. Lukongo. During the event, Dr. Patin stated that the Senate was created to allow all members of the SU Ag Center to have a voice in decision-making according to the rules and regulations of the Ag Center’s Handbook. “The main goal of this meeting is to be a transparent organization and become a single voice,” said Patin. All faculty and staff members employed at the SU Ag Center who hold professional rank, at least 75% appointment, in a full time positions; who do not hold a temporary position; and who do not hold an administrative position higher than program leader or director were able to vote on the Senate’s Constitution and By-laws, using Election Buddy online software. There only needed to be an overruling majority from the 59 Ag Center full time faculty and staff members to approve the documents. The Senate’s documentation will be submitted to the Southern University Board of Supervisors before the next board meeting held in New Orleans, Louisiana on Friday, November 27 to be officially recognized by the board. “This is your organization and it is as strong as you are in this organization,” finished Patin. Zanetta Augustine, Extension Associate at the SU Ag Center standing on far right in purple, leads Fall Gardening Workshop attendees on a tour of the Center's greenhouse. Baton Rouge, La. 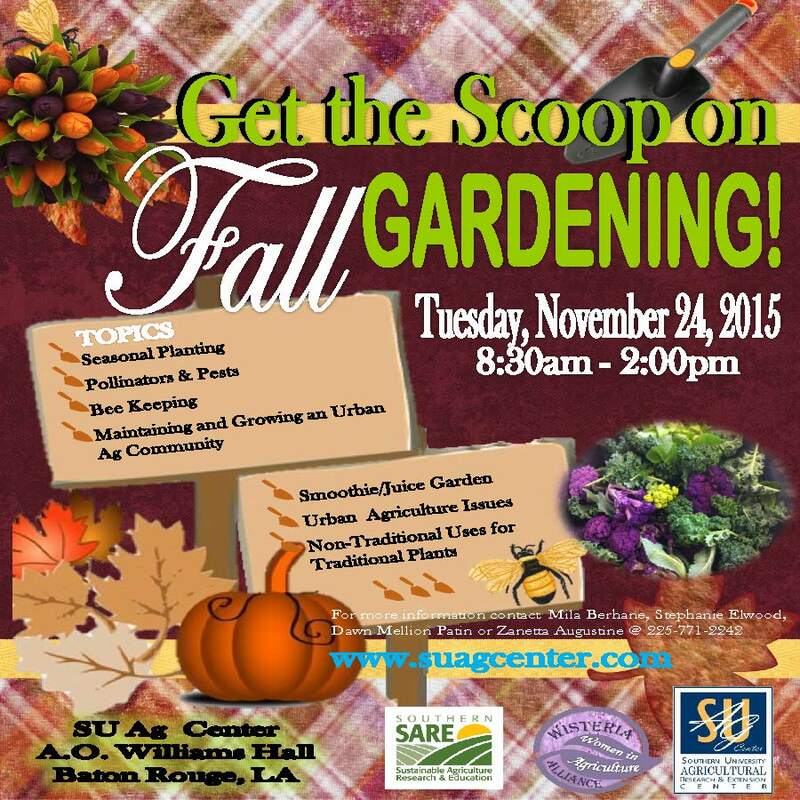 – The near freezing morning temperature didn’t stop almost 100 attendees from showing up for the Southern University Ag Center’s Fall Gardening Workshop, held on November 24 in A.O. Williams Hall – SU Ag Center. Prior to the start of the program, attendees were treated to smoothies and a juice breakfast bar made from vegetables grown in the Center’s Urban Demonstration Farm. Stephanie Elwood, Extension Associate at the SU Ag Center, provided the attendees with recipes to make the smoothies and juices at their homes during her presentation on Fall Season Planting and Smoothie and Juice Gardens. SU Ag Center Vice Chancellor for Extension Dr. Gina E. Eubanks welcomed the packed crowd to the workshop and to the Southern University Ag Center. Other presentations included Pollinators and Pests: Encouraging Healthy Ecosystems, which explained how some insects assist in the pollination of plants; Bee Keeping: Raising Queen Bees in the City, which discussed how to transplant a queen into a bee colony and maintain a bee colony in an urban environment; The Human Element: Maintaining and Growing an Urban Agriculture Community, which focused on community gardening and Non-traditional Uses for Traditional Crops, such as harvesting and selling banana leaves and making jelly from corn cobs. Attendees were also given the opportunity to share topics that they would like to learn more about during the next workshop with the Ag Center’s staff. The workshop ended with a tour of the Southern University Ag Center’s greenhouses and its Urban Demonstration Farm. The Fall Gardening Workshop was co-sponsored by the Southern University Ag Center, its Wisteria Alliance Program and the Sustainable Agriculture Research and Education (SARE) Program. For additional information about gardening, the SU Ag Center’s Urban Demonstration Farm or to schedule a tour of the Farm, contact Mila Berhane, Stephanie Elwood, Dawn Mellion-Patin or Zanetta Augustine at 225-771-2242. Baton Rouge, La. – On World AIDS Day, December 1, 2015, the Southern University Agricultural Research & Extension Center in collaboration with the AIDS Healthcare Foundation, will harness the power of social change. Youth in St. Helena and Tangipahoa Parishes will be encouraged to, “Dream big! End it,” through the arts. Ending the AIDS epidemic is possible, but only by educating our youth and connecting them with people who have access to HIV prevention, treatment, care and support services. 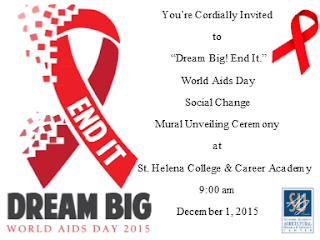 World AIDS Day activities will kick-off at the St. Helena College & Career Academy, at 9:00 a.m., as Gifted & Talented Art students, Shy’Janae Hookfin and Javier Smith, unveil the “Dream big! End it,” social change mural. 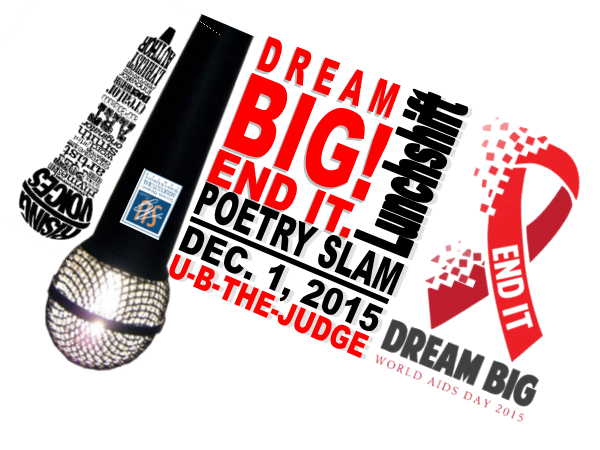 Immediately following the unveiling ceremony, students at Kentwood High Magnet School will gather during their regular lunch shift for a ‘Poetry Slam.’ Youth participants will use word play to encourage their peers to Dream big, and end the HIV/AIDS epidemic. “Dream big! End it,” means empowering youth in Louisiana, to take a stand for people who may not necessarily be able to stand for themselves. It encourages the students to be a voice of reason when their peers are being pressured into compromising situations. It also opens the door for dialogue with key decision makers in congress when youth dream big to end this crippling epidemic. · Reducing the large percentage of new HIV and syphilis diagnoses in Louisiana. According to the Louisiana HIV, AIDS and Early Syphilis Surveillance Quarterly Report released on June 30, 2015, 25% of all new HIV diagnoses in 2014 occurred among persons 13-24 years old. The report also stated that in the first half of 2015, 44% of all early syphilis diagnoses occurred among persons 13-24 years old. · The 19 million people who are unaware of their HIV-positive status can begin to get support. · Access to medicines for all children living with HIV/AIDS in Louisiana. · All people can be included as part of the solution. For more information on how you can get involved, please contact Nicolette Gordon, (Assistant Area Agent – Youth Development), in the Tangipahoa Parish Extension Office at 985.748.9381, or in the St. Helena Parish Extension Office at 225.222.4136. *Information in this press release was obtained from the Louisiana HIV, AIDS and Early Syphilis Surveillance 2015 2nd Quarterly Report and “The Gap Report,” published by UNAIDS. 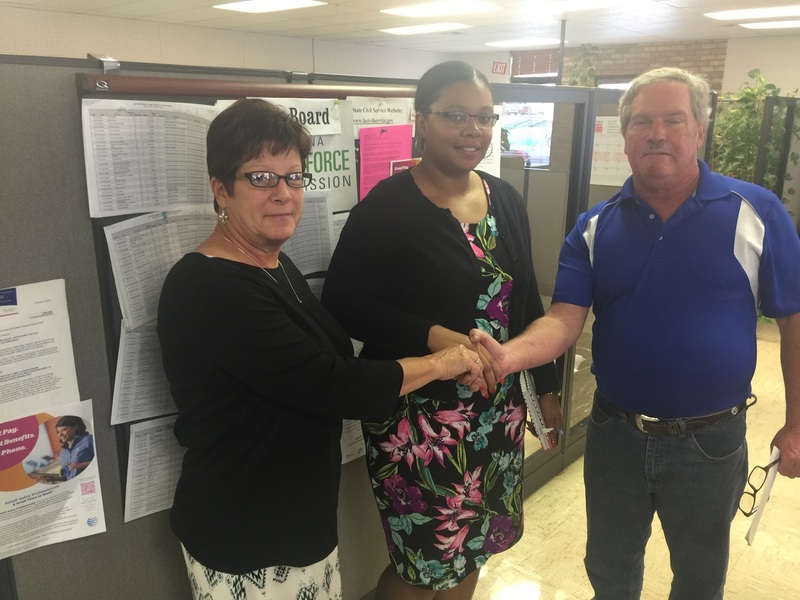 From left, Brenda Higdon, Krystle Washington and Michael Morris pose for a photo after a recent meeting. Baton Rouge, La. - Professional Development is a cornerstone of Community Development. Krystle J. Washington, Extension Educator, has formed a partnership with: Acadiana Works, Louisiana Workforce Commission, Acadia Parish Business and Career Solution Center, Evangeline Parish Business and Career Solution Center, St. Landry Parish Business and Career Solution Center, St. Martin Parish Business and Career Solution Center, and Vermillion Parish Business and Career Solution Center to provide a series of professional development workshops on resume’ writing and editing, interview etiquette, and how to dress for success. After initially meeting with Michael Morris, Director/ Workforce Investment Board Member of the St. Landry Parish Business and Career Solutions Center and Brenda Higdon, Workforce Development Supervisor; a needs analysis was conducted and it was deemed necessary to provide professional development for adults in the various parishes. The workshops are set to begin within the coming weeks. Baton Rouge, La. - The Southern University Ag Center has received a letter of intent from the National 4-H Council in the amount of $115,920 to fund the Center’s 4-H National Mentoring Program. The SU Ag Center's 4-H National Mentoring Program seeks to rebuild broken family units who have been impacted by parental incarceration. 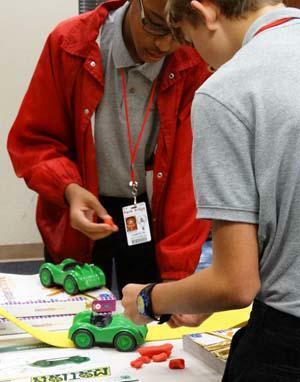 The program engages youth ages 5 to 17 in interactive family activities that include the incarcerated parent and the caregiver. For additional information about the Southern University Ag Center's 4-H National Mentoring Program contact the grant’s Principle Investigator Tiffany Wilkerson-Franklin, at tiffany_franklin@suagcenter.com; Co- Principle Investigator Milissia John-Baptiste, at milissia_jbaptiste@suagcenter.com or by calling 225-771-2242. 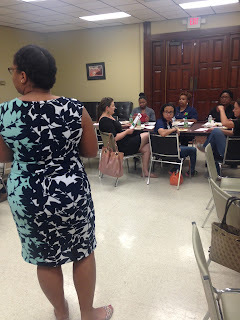 Marquetta Anderson, East Baton Rouge and East Feliciana Parish Nutrition Educator, leads a discussion on nutrition at Bishop Ott’s Women’s Shelter on Oct. 26, 2015. Baton Rouge, La. - The SU Ag Center’s Families First-Nutrition Education and Wellness System Program (FF-NEWS), continues to cultivate partnerships with inner city social service programs and organizations. On October 26, 2015, East Baton Rouge & East Feliciana Parish Nutrition Educator, Marquetta Anderson, educated the participants at Bishop Ott’s Women’s Shelter on the importance of making better food choices. Following the lesson, Mrs. Anderson opened the floor for questions and a group discussion. The ladies were especially interested in daily water intake recommendations, reading nutrition labels, and how to decipher whole grains. “We appreciate the work that the SU Ag Center and Mrs. Anderson do here at the shelter. She has been coming to us, consistently, for over a year and were glad to have her,” said Ms. Reid, Daytime Program Coordinator. While Mrs. Anderson prepared their fresh fruit salads, the ladies shared what changes they planned on making in their diets and food selection going forward. 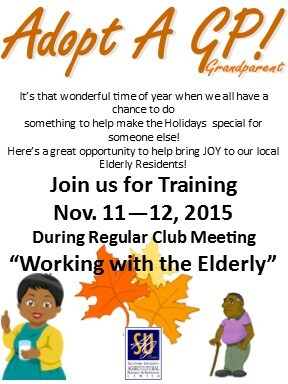 Contact us with questions or comments regarding our programs at ellen_mcknight@suagcenter.com. Krystle Washington addresses the STL PROUD Coalition during a recent meeting. Baton Rouge, La. - Extension Educator Krystle J. Washington has joined the St. Landry Preventing Rx Overuse and Underage Drinking (STL PROUD) Coalition. The organization, formerly known as the St. Landry Parish Children and Youth Services Planning Board, includes approximately 20 non-profit organizations, state agencies, local municipal governments, and businesses which service the needs of children and youth in St. Landry Parish. STL PROUD targets the 12-25 age group. St. Landry Parish has been selected by the Louisiana Partnerships for Success as one of 10 high need parishes in the state to address the priorities of underage drinking, prescription drug misuse/abuse, and depression. In addressing these priorities, the St. Landry Parish Children & Youth Services Planning Board has branded itself as the STL PROUD Coalition. In highlighting the acronym STL PROUD, the intent is to bring positive presence in addressing the ills of underage drinking and prescription drug misuse/abuse. For more information on STL PROUD, please visit their website, at http://www.stlproudcoalition.com/. For more information on how you can be involved, give suggestion, or questions/ concerns; contact Krystle J. Washington at Krystle_Washington@suagcenter.com. Baton Rouge, La. - The SU Ag Center recently released a video on the 2015 4-H National Youth Science Day (NYSD) event held on Oct. 7. Youth in East Baton Rouge Parish joined hundreds of thousands of youth across the world in leading the eighth annual 4-H National Youth Science Day experiment, which combined cars, calculators and cell phones to show how physics principles influence a pressing problem among U.S. teens. This year’s experiment was titled ‘Motion Commotion’ and the event attracted 105 participants. Tiffany Wilkerson-Franklin, Program Coordinator at the SU Ag Center has been coordinating 4-H NYSD's for four conservative years. Baton Rouge, La. 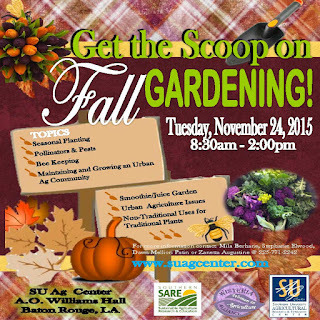 – The Southern University Ag Center invites the Baton Rouge community at large to its third annual Fall Gardening Workshop on November 24, 2015. Registration for the event, which is free and includes a healthy lunch, will begin at 8:30 a.m. and the program will start at 9 a.m. inside A. O. Williams Hall - SU Ag Center. There will even be an urban garden tour if the weather permits. Besides learning about planting and how to keep a garden in an urban society, participants will also be able to taste-test smoothies and juice made from the plants in the urban garden. This event will link the participants to gain opportunities to grow or enhance an urban garden successfully. “This is going to be an action packed event,” said Stephanie Elwood, Extension Associate of the Southern University Ag Center. The workshop is co-hosted by the Southern University Ag Center, its Wisteria Alliance Program and the Sustainable Agriculture Research and Education (SARE) Program. For more information about the workshop, contact Mila Berhane, Stephanie Elwood, Dawn Mellion Patin or Zanetta Augustine at 225-771-2242. Baton Rouge, La. – Not everyone who lives in a retirement community gets visitors, and the Southern University Ag Center has teamed up with the St. Helena Parish Nursing Home & Kentwood Manor to help bridge that gap. "Adopt-a-GP,” which is a short acronym for Grand Parent, is a community service project used to pair a teenager in the community, with one elderly person. Teens will visit and spend time with them during the holiday season playing games, dancing, creating crafts, and hanging holiday décor. For more information on how you can partner to enhance our Adopt-a-GP! Community Service Project, contact Nicolette Gordon in the Tangipahoa Parish Extension Office 985.748.9381, or St. Helena Parish Extension Office 225.222.4136. Baton Rouge, La. – The Southern University Agricultural Research and Extension Center’s Interim Chancellor Adell Brown, Jr., was the opening speaker at the Society of American Foresters (SAF) on Nov 5. 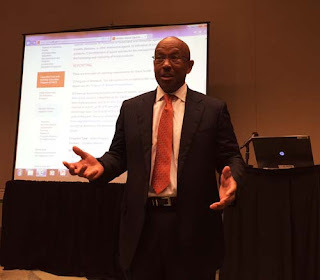 The 2015 National Convention scientific session was titled “Recreating Forestry through Research, Education and Outreach.” Brown emphasized the importance of partnerships and collaboration among universities, the need for agriculture and forestry research and education, and the role that SU Ag Center plays in research and education. He invited the participants to visit the Center during their stay in Baton Rouge. For the first time in the history of SAF, the national convention was hosted in Baton Rouge, Nov 3-8. The Urban Forestry Program at Southern University plays an active role in leading and organizing urban forestry sessions at the convention. The events organized by the urban forestry program include the convention scientific technical session hosted by Program Leader, Dr. Kamran Abdollahi; the convention urban forestry technical field tour led by Professor Zhu H. Ning; and an agriculture and urban forestry exhibit. The program faculty also made four oral presentations and displayed eight research posters. Baton Rouge, La. 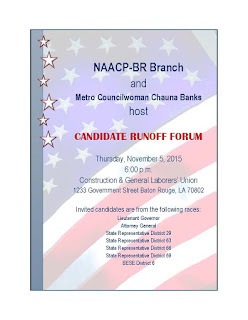 – Adell Brown, Jr., Ph.D., interim Chancellor of the Southern University Ag Center, will serve as the moderator of a 'Candidate Run-Off Forum' on Thursday, November 5, 2015. 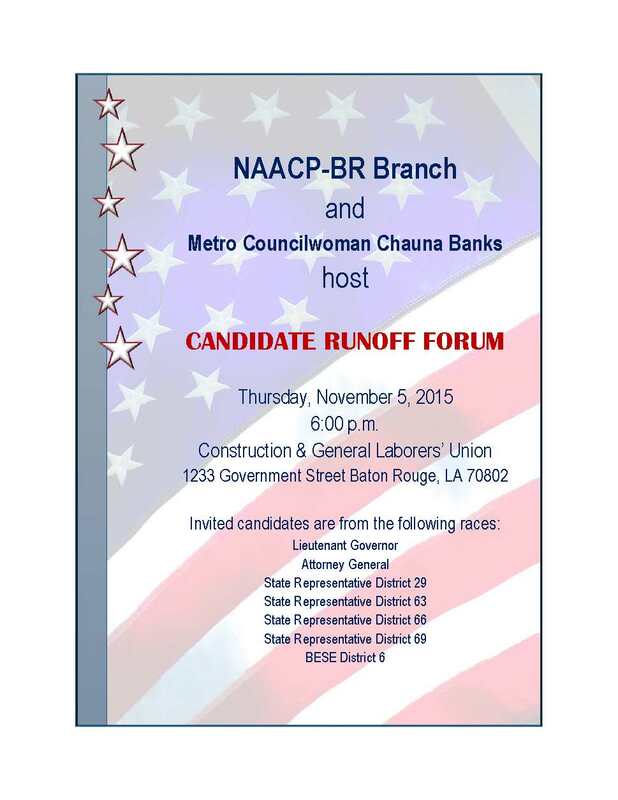 The event, sponsored by the Baton Rouge Chapter of the National Association for the Advancement of Colored People (NAACP) in conjunction with Metro Councilwoman Chauna Banks, will be held at the Construction & General Laborer’s Union Hall, 1233 Government Street, Baton Rouge, LA., from 6 p.m. until 8 p.m.
For additional information about the forum, contact Erika L. Green at erika@eglawoffice.net.